Have you ever wondered what it would be like to try to recruit Batman? 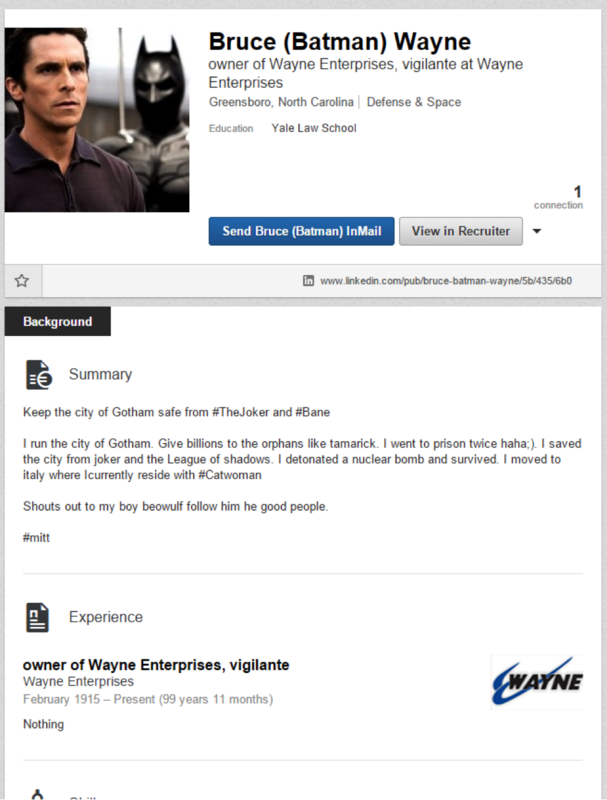 I’ve always wondered if I could find out how to recruit him if I was working for Wayne Enterprises Advanced Research Division. You know, the place that has all the fancy new, top secret, exciting tools and toys? With all of those fancy toys, I’m sure I could track down and recruit Batman. Or at least invite him to have a conversation about a career opportunity! Alas, like most of us, that fantasy still eludes me. In fact, according to a 2012 Novo Benchmarking Survey, 65% of companies have 2 or fewer professionals on staff that work the recruiting process full time. That means the majority of us have very limited resources. Many don’t have access to LinkedIn Recruiter or a job board. With these strict limitations, how do you create an effective recruiting strategy? My hope is to show you several free and low cost tools that can be used in combination to help you create an effective sourcing strategy. The first step is to understand the tools that are available. The second step is to learn how to use those tools in combination to give you the best possible chance of producing viable candidates in a short period of time. The final step is presenting your plan and executing it. You can’t fight crime at night in Gotham without the right tools. Batman has a variety of tools at his disposal that help him deal with any threat he might be facing. Similarly, we have our own virtual recruiting bat belt. The ATS can be a gold mine. Most companies have massive databases of what are effectively passive candidates. But how can you use this tool to help you fill your open jobs today? ATS’s all have a search feature. Keyword searching resumes in your existing database is optimal. Reaching back out to your “silver medalists” is often the shortest distance between two points. A “silver medalist” is a candidate that made it to the final stages of the interview process but did not ultimately get hired. There are many reasons a well-qualified candidate was not offered a specific job. It’s a best practice to revisit those candidates early on in your search. Don’t forget, the ATS can also be an excellent source of information for mail merge email campaigns. In 2011, Indeed began collecting resumes. Initially, uploading a resume was a tool to improve job search results. However, over time, the site assembled a massive resume database. The great news for recruiters is that currently any recruiter can access the Indeed resume database for free. It takes less than two minutes to gain access to one of the largest resume databases on the planet. Also, Indeed offers an automated resume alert. Once you have honed in on a good search you can set an alert for new resumes. I recommend using this feature in every job board. Having resumes delivered to your inbox in the morning is almost as good as having the intern bring you a fresh cup of coffee. All things considered, Indeed is the best tool a recruiter on a budget could ask for. In today’s world of extremely tight budgets Indeed offers, in my opinion, the best return on your recruiting dollar. The best part is you are not committed to a limited number of seats or licenses. You will never get a call from Indeed asking you to stop sharing. You can pay for what you need, as you need it Indeed is a great tool for finding generalists but if you need to find a specialist like Batman, you will have to dig a little deeper. Netprospex is a business to business contact exchange market place. Contacts can be purchased for a dollar or you can trade contacts on the exchange for a download credit. Every contact that Netprospex accepts gives you a free credit to download contact information for new prospects. I have traded thousands of contacts this way and have been able to generate targeted lists of prospects to contact. Good news! There is still a free version of LinkedIn! The first step is to build out your profile. Indicate your areas of responsibility and give prospective candidates a way to contact you. You should view your LinkedIn profile as more than an online resume. It is your online advertisement. Not only will it be used to attract candidates but it will also help you build and establish credibility. This will be especially important if you are working for a small company or a staffing firm. Once you have a working profile, you need to build your connections. Remember the list you generated from your ATS? You have contact information reach back out to former applicants and invite them to stay in contact! You can upload your list as a .csv file and send out a group or invitations or, if you would like to increase your acceptance rate, send a note stating that they applied in the past and you would like to stay connected so that you could discuss future opportunities. LinkedIn is also an excellent way to quickly reference candidates from your ATS or other source. I like to run a side by side comparison. One technique is to run a report from your ATS and identify all of the former applicants for a role that is similar to the one that you are recruiting for now. I then do a side by side search of LinkedIn and my spreadsheet. If the person’s profile looks like they would be a good match for the open job it is simple to contact them using the contact information from your spreadsheet. You can still join up to 50 groups and email anyone in those groups who have indicated they are open to communication from group members. The nice thing about this is that it still doesn’t cost you anything! Prophet is an add on for your web browser that works in connection with LinkedIn. The nice thing about Prophet is that it can provide information about other social profiles such as twitter or Google+. Additionally, it sometimes is able to provide email address or phone numbers. The first step in any strategy should be to do your homework. Anytime a new threat arises in Gotham the first thing that Bruce… Batman does is consult is own database. Batman starts his search in the library and so should you. The first library to check is your own ATS. Run a report from your ATS and find out who has applied to similar jobs in the past. The most important fields are the prospect name, email, phone number and role they applied to in the past. Export your report into Excel. I recommend .CSV format because it will be easier to use your list against other sources of information. Once you have a viable list you can then go to a contact exchange service, such as Netprospex and gain additional contacts you did not have before. Most contact exchange services allow you to upload contacts from an Excel spreadsheet if they are in .CSV format. These lists can be used in and of themselves to conduct email mail merge campaigns but I believe it is much more effective to leverage a list against another source of information. If you are searching for generalists it might be a good idea to start searching Indeed.com. I keep my list handy and compare my list with the names of the candidates that I have sourced from my ATS and contact exchange service. If I already have the contact information for someone, I contact them immediately. The second place I would search would be on LinkedIn. This is where I use Prophet. It’s great for helping me find contact information for prospects in many different verticals. Next, I pull up my Excel list would then use side by side screens to search for contacts from my lists. At this point, if it looks like the person is a good match for my job, I send a personalized email directly to the prospect.